Final humiliation, Dinh La Thang (standing, in blue jacket) awaits his sentence for economic mismanagement. 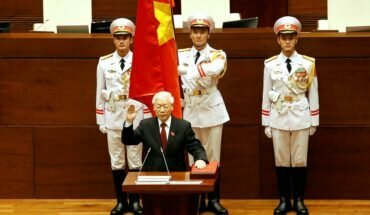 A court in Hanoi has handed out long prison sentences to once prominent figures in the Communist party in a clear demonstration of the power and ambition of the party’s current leadership. The former politburo member, Dinh La Thang, and the once flamboyant state oil executive, Trinh Xuan Thanh, were shown handcuffed and pleading for leniency during the trial – a public humiliation that will strike fear into the hearts of anyone that prospered under the previous state administration. Thang received a 13 year sentence, the most senior official to face criminal sanctions in decades, while Thanh, who Germany says was abducted from a park in Berlin by Vietnamese agents last year, was given a life term. 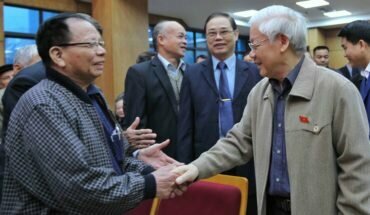 In a country where protestations of judicial independence are taken with a pinch of salt, the verdict highlights the new found authority of the Communist party’s general-secretary, Nguyen Phu Trong, who has made clear his leadership of what he calls an anti-corruption campaign. 22 former senior officials of PetroVietnam, the sprawling state oil firm, were convicted in the latest trial – the high point so far in a campaign that has been gathering momentum since Trong’s reappointment as party boss in January 2016. 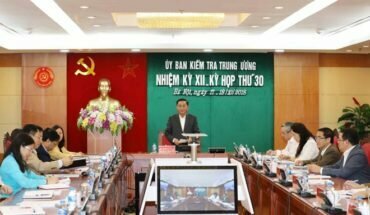 Thang and Thanh are both high profile figures associated with the former prime minister, Nguyen Tan Dung, who lost out to Trong in a bid for leadership of the Communist party. Thang was convicted of deliberately violating state regulations on economic management, leading to severe losses during his time as head of PetroVietnam. Thanh, who led the firm’s construction arm and then received political appointments before fleeing the country last year, was also convicted of embezzlement. The message is that anyone who enriched themselves during the boom years of the Dung ascendancy has reason to fear for their future. Some observers believe that Trong is serious about tackling corruption and is beginning by targeting a clique of self serving officials that rose to power and riches during Dung’s terms in office. Others suspect that the primary motivation is political, with Trong and the national security establishment using corruption allegations to lay waste a rival faction and consolidate their hold on the party. Most agree that high profile show trials will not be enough to tackle an epidemic of corruption that has severely tarnished the reputation of the Communist party and is seen as a blight on the lives of ordinary people.